Impression of a tinted Phal. The tropics may be predominantly green, but the horticultural team at Selby Gardens has other ideas for their latest exhibition in the Tropical Conservatory in Sarasota, Florida. ‘Colors of the Tropics: Explore Nature's Palette’ features vivid fabric banners and clues to the 800 plants in the conservatory for display through to November 7. Pantone colour wheels encourage visitors to match paint chips with the flowers and help them understand how the colours of nature inspire interior decorating. The gardens also added a textile theme, recruiting knitters to decorate trees and branches for each section. It’s not intended to be authentic, far from it, but a way to to look at the plants in different ways. 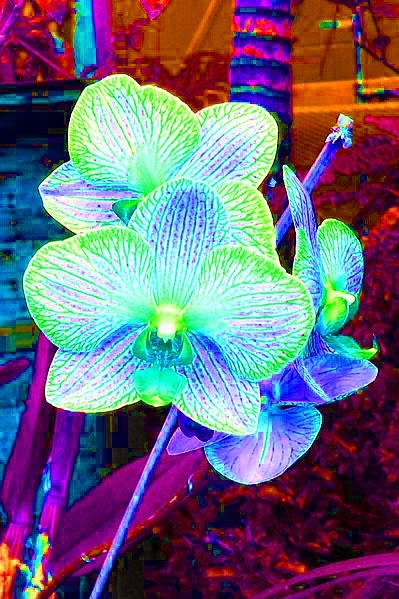 For the blue section, artificially-tinted phalaenopis orchids stand alongside blue plumbago and some flowers and plants with ‘blue’ in the name. Staff admit the dyed orchids haven’t clicked with some visitors, says Lara, but they do provide a chance to educate people about capillary action.